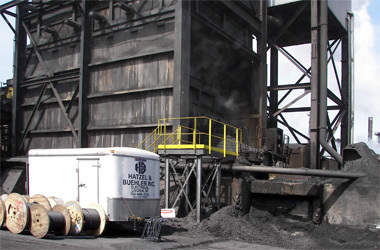 DTE Energy Services owns the EES Coke Battery Project, which supplies the Detroit, Michigan area with a valuable critcal raw material used in the steel making process – mettallurgial coke. The downside to the process of making mettallurgical coke is the by-products that are generated. Some of the critical waste for removal is phenol and mercury contaminating the waste water. Conestoga-Rovers & Associates from Waterloo, Ontario has engineered a system to remove these contaminates from the waste water returned into the Detroit Water and Sewer System. Hatzel & Buehler worked on the design build phases of this project for 2 ½ years before starting the construction phase. Hatzel & Buehler is completing the entire electrical system from the 4,800 volt feed for the substation to the instrumentation and heat trace the critical systems need to operate.